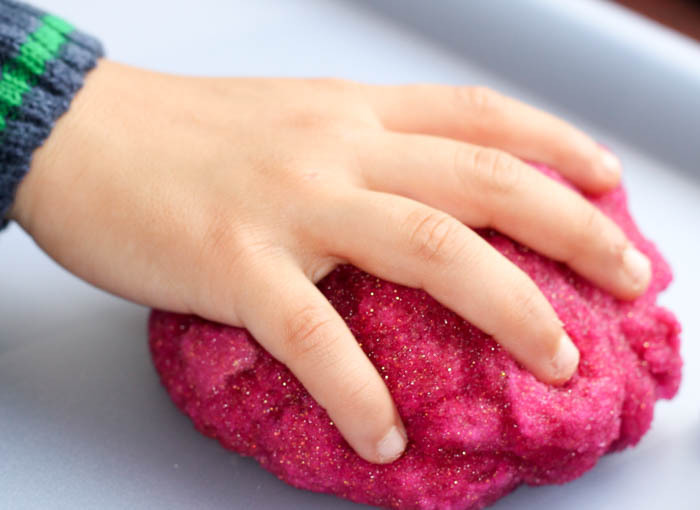 I love to experiment with simple playdough recipes, especially when they are very easy to make. 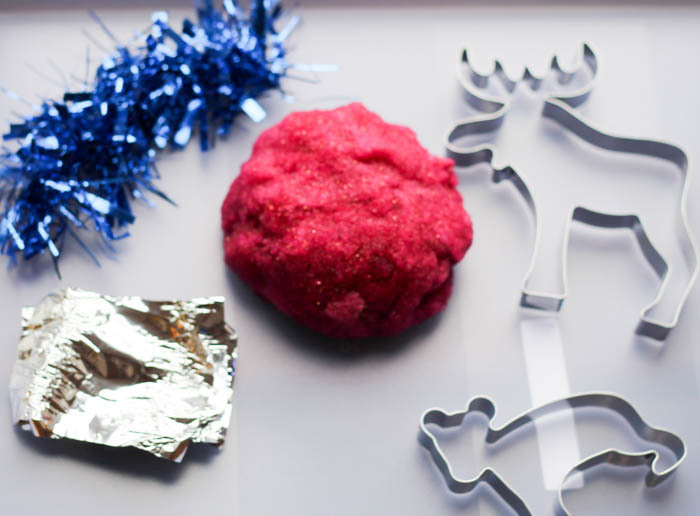 I decided to make this sparkly gel dough recipe from a few supplies we had in our craft and play materials cupboard so that the boys would have something sparkly and festive to play with this winter. 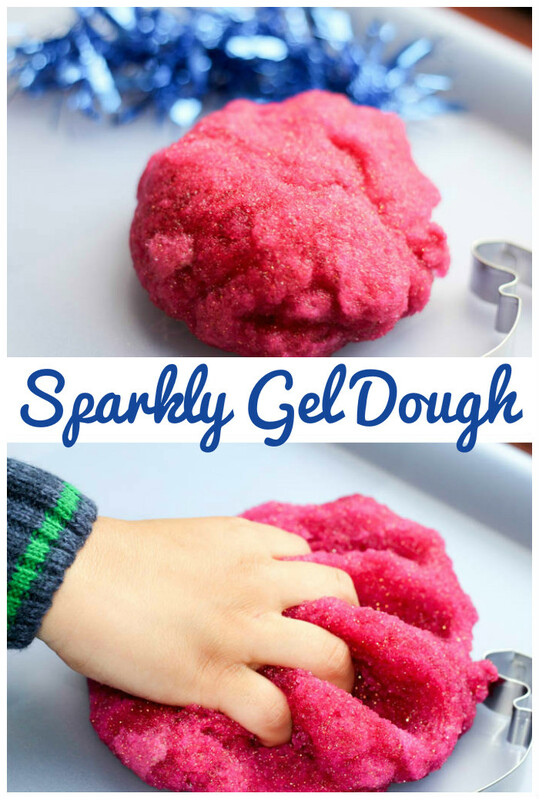 This is actually an adaptation of a play material we’ve used previously which you can buy from toy shops, but I will tell you how to make this type of gel dough from scratch too. If you don’t have Gelli Baff it’s made from Sodium Polyacrylate which you can buy (eg from Amazon) or use insta snow if you have it, since that’s made of the same material. You could also just cut open a few clean nappies / diapers and take out the contents since that is the same substance used. This substance is safe for children to touch but not to taste or eat – so of course not suitable for children who will be tempted to taste it. I do have a baby safe alternative which I will share with you all soon! If using the plain sodium polyacrylate or insta snow then you will need to add your own colouring to the dough, whereas the Gelli Baff option does all that for you. I used the Lava Blast colour, which is red but can become pink if you dilute it more so if you want it to stay red just be aware of that! First you need to hydrate your gelli baff / sodium polyacrylate / nappy or diaper filling (whatever you are using as your water absorbing polymer). Do this by sprinkling the powder slowly over your water and observing the changes, you want it to form a squishy substance that’s quite thick. If you make it too thin then it won’t be able to roll up into a ball or be picked up, so you want your ratio of polymer to water to be more than you would if making this for the bath. You can use trial and error until you get the right consistency, if you add it slowly and keep observing and mixing as you add, then it should come out fine. To get the glitter effect throughout the dough, I used diluted glitter paint (similar to this) rather than plain water to hydrate the gelli baff. To make the dough a little firmer and more easily able to handle, we added about 3 spoons of cornflour. You need to mix this in very well – take your time with it. Leave the dough so that it has chance to firm up a bit before playing. We left ours over night – not in the fridge as we had no space although that might help. It was fine outside though! This recipe will give you a gel like dough which is very squidgy but can still be rolled and molded into balls. The texture is very squishy and lots of fun. The boys all had fun squishing and squeezing it, and playing around with a few accessories in the dough. We used some left over sweet wrappers to roll the gelli dough into balls and wrap them up. I also added some tinsel for a bit more colour and to add some extra sparkle. We included some cookie cutters / playdough cutters, although the dough doesn’t hold it’s shape so well after being shaped with a cutter the kids enjoyed plunging the cutter into the dough and playing around with them. It is a messy dough and will get on to your child’s hands. 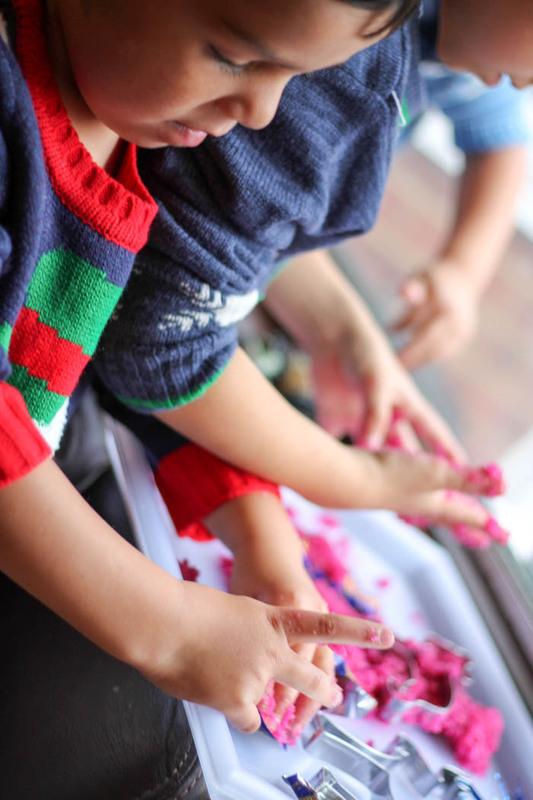 If they are tactile defensive then they may not like this type of playdough but its great for those who do seek extra sensory input and although it gets onto the hands it does not stain the hands with colour at all and is easily washed off. We loved how pretty and sparkly it looked as well as the cool texture! This gel dough will last well, just roll it and put it in a zip lock bag for next time. 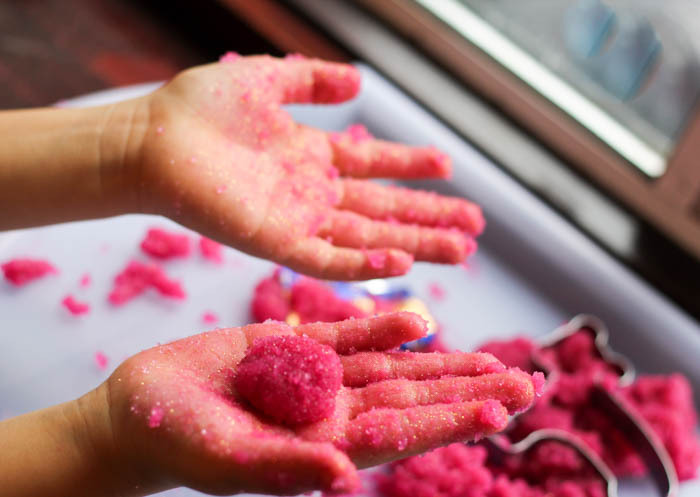 Or if you want to experiment with it after you have finished playing, add some extra water then have your child sprinkle salt over it and mix it and you will see the dough dissolve down into a liquid. 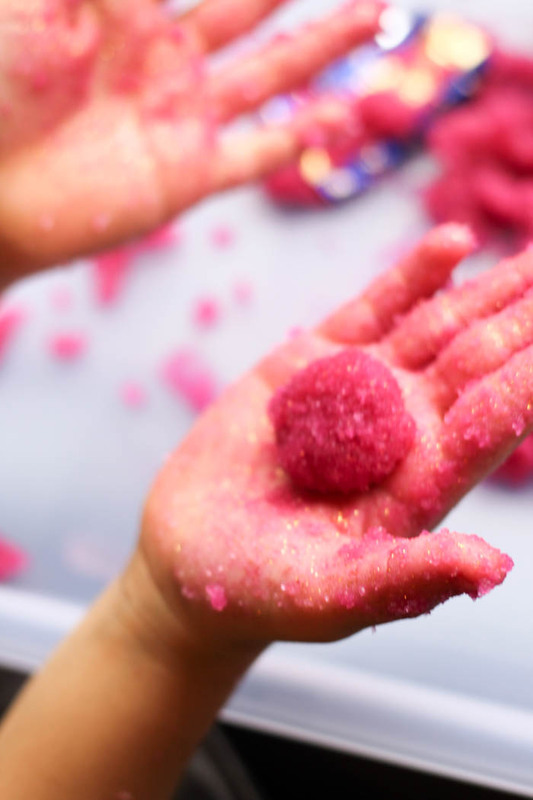 We might try next time with adding glitter glue along with water just to see how that changes the consistency – whether it makes it more sticky, or more slimy. Grace says – I am in glitter heaven with this. It’s so pretty and sparkly. Lucas says – And you can get messy too……… AWESOME!!! This looks great, definitely going to give it a go! This looks interesting. I know I wont like it, but I know my girls would love it.